Mumbai: The Delhi-based Burman family, promoters of consumer packaged goods maker Dabur India Ltd, has formed a joint venture (JV) with Espirito Santo Investment Bank for investment banking and institutional brokerage businesses in India. “We always thought that we didn’t have the expertise to run financial services business. We look at it as an investment where we will have board seat," he said. “If we get a value, maybe 10-15 years down the line (we could exit), but we have no intention of running financial services businesses," he said. The Burmans bought a 25% stake in the India asset management company of Fidelity group in 2004 but sold it back to the US parent in 2007. They also owned 6% in Lord Krishna Bank before it was merged with the Centurion Bank of Punjab in 2007. 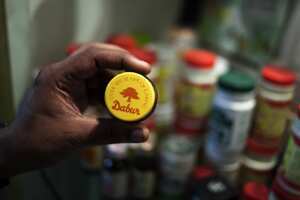 Dabur also owns a 74% stake in Aviva Life Insurance Co. India Ltd.
Espírito Santo Securities has an institutional research and trading business in India currently with 13 analysts covering 48 companies. The deal could represent new cross-border opportunities for his bank as well as the Burman family, said Jose Maria Espirito Santo Ricciardi, president and chief executive at Espirito Santo Investment Bank. “We started to talk about two years ago. This is (one of) the most important markets in the world. We are already present in 23 countries and for us it was important to come here," he said. The Portuguese company is in India for the long haul, said Ricciardi. “We have gone to other markets where there were banks but when we go we stay for many years. We want to be closer to local companies and people." Espirito’s strategy is to focus on institutional business and it will help Indian firms expand operations in Africa and Latin America, said Nick Paulson-Ellis, country head, India, Espirito Santo Securities. “We have presence in Brazil and seven different African countries. That’s unique because there is no other broker in India that can claim that kind of ability," he said. Espirito Santo will have to choose a niche in India if it wants to make a mark, said a co-head of investment banking at a rival firm. “They will have to decide if they want to focus on mid-cap companies or large ones, debt or equity. There are opportunities from Indian firms but a new bank has to build credibility in a segment to take advantage of the opportunity," he said, asking not to be identified.